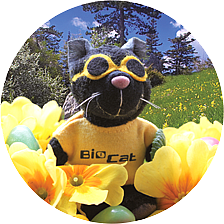 Bioline’s SensiFAST qPCR Kits and Master Mixes providing outstanding assay reproducibility, sensitivity and robustness are now exclusively offered by BioCat. High-performance PCR enzymes developed by Bioline for a wide range of applications are also available. The ExACT Genotyping Kit enables the quick extraction and amplification of DNA from a variety of tissues. EconoTaq DNA Polymerase is an economic thermostable DNA polymerase purified from E. coli PVG-A1 recombinant strain expressing Thermus aquaticus YT1 DNA polymerase gene. For high-throughput PCR and routine PCR EconoTaq® PLUS 2X Master Mix is your mastermix of choice. The proprietary PCR enhancer enables amplification of difficult templates. EconoTaq PLUS GREEN includes inert gel loading and tracking dyes. The Encyclo PCR Kit is suitable for the amplification of difficult templates as well as for long-range PCR (up to 15 kb). The polymerase mix included in the Encyclo PCR Kit consists of a thermostable DNA polymerase and a proofreading polymerase and provides automatic hot start. 2x EvaGreen qPCR Mastermixes containing EvaGreen fluorescent dye and 2x qPCR Mastermixes for Probe-based qPCR are optimized for outstanding sensitivity and specificity. Specialized master mixes are offered for the different real-time PCR instruments. Customized real-time PCR probes and primers with performance-optimized CAL Fluor, Quasar and BHQ dyes suitable for multiplex qPCR are offered. The dyes can be incorporated into a variety of popular probe designs, including dual-labeled TaqMan and Molecular Beacon probes, Black Hole Scorpions, and Amplifluor Direct primer systems.